Enjoy some of our favorite Fox and the Hound quotes. Don’t remember the movie? Here’s a short synopsis to jog your memory. 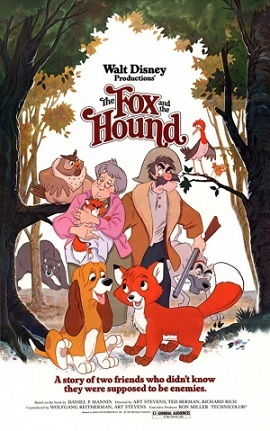 Disney’s 1981 beloved film The Fox and the Hound follows two unlikely friends: Tod, a recently adopted fox, and Copper, a hound dog puppy. Best friends from the start, the duo plays every day until Tod’s antics cause Amos, Copper’s owner, to try and kill Tod. While Tod’s owner, Widow Tweed, protects Tod, he and Cooper start to drift apart. Things come to a dramatic head when Copper’s hound mentor, Chief, suffers an injury after a railroad track chase with Tod. Amos and Copper vow to get revenge for Chief. In fear, Widow Tweed releases Tod into the wild to find safety. There he meets Big Mama, a wise owl, and Vixie, a lady fox, who teach him the ways of the forest. One day, Amos and Copper find Tod and Vixie. After a short chase, a bear suddenly attacks Amos and Copper. Tod saves Copper from the bear, but Amos catches up and tries to shoot Tod. Copper, touched by the loyalty of his old best friend, stands in front of Tod and saves him. Copper returns home with Amos, and Tod and Vixie return to the forest. Though they will live apart, you know that Tod and Copper will always be best friends in their hearts. Read and share these treasured Fox and the Hound quotes will that teach you about love, friendship, and loyalty. Widow Tweed: We met it seems, such a short time ago. You looked at me, needing me so. Yet from your sadness, our happiness grew. Then I found out, I need you, too. I remember how we used to play. I recall those rainy days, the fires glowed, that kept us warm. And now I find, we're both alone. Goodbye may seem forever, farewell is like the end. But in my heart's a memory, and there you'll always be. Amos Slade: Chief, get back in there before I break your other leg. Young Tod: Copper, you're my best friend. Young Copper: And you're mine too, Tod. Young Tod: And we'll always be friends forever. Won't we? Big Mama: Listen good, Tod, 'cause it's either education or elimination. Young Tod: I bet you'd be good at playing Hide and Seek! Wanna try it, Copper? Young Copper: Can I use my nose? Young Tod: Sure. Okay, now go ahead and close your eyes and count. Young Tod: No, Copper! You can't peek! Young Tod: Now, try again. Adult Copper: Tod... I don't want to see you get killed. Young Copper: If you give me a headstart I can beat you. Adult Copper: [to Tod] I'll let you go this one time. Big Mama: [to Tod] Now, if you're so foxy, and old Chief's so dumb, then why does that hound get the fox on the run? 'Cause he's got the hunter, and the hunter's got the gun. Kablaam! Elimination. Lack of education. Young Tod: Oh, Big Mama, I know Copper would never track on me down. Why, Copper, he's my very best friend. Big Mama: Ho-ho, your best friend! Now Copper's gonna do what he's been told. Supposed to chase the little fox in the old fox hole. And along comes the hunter with a buckshot load. Boomer: [pretending to shoot a gun] K-K-Kabaam! Dinky: [lying on the ground] Lack of education. Big Mama: You better believe it, Tod, yes siree. Young Tod: You mean Copper is gonna be my enemy? Adult Copper: I think I did a good job tracking down those varmints for ya. Chief: Trackin' an' smellin' ain't enough. You gotta think nasty. Adult Copper: Tod, if it's the last thing I do, I'll get you for this! Widow Tweed: Amos Slade, that temper of yours is going to get you into a lot of trouble someday. Amos Slade: [turns red in the face] Temper? Temper? Woman, you ain't seen my temper! If I ever catch that fox in my property again, I'll blast him, and next time I won't miss! Widow Tweed: Amos Slade, you trigger-happy lunatic! Give me that gun! Widow Tweed: [pointing the gun at Amos] Hold it, right there. Amos Slade: Watch it, that thing's loaded. Widow Tweed: Now it ain't loaded. Young Tod: A worm for breakfast? Yuck! Young Tod: What are you smelling? Young Copper: I'm on the trail of something. Young Tod: Trail of... what? Young Copper: I don't know yet. Young Copper: Why it's... it's you. Young Tod: What'd you do that for? Young Copper: We're supposed to do that when we find what we've been tracking. Young Tod: I'm a fox. My name's Tod. What's your name kid? Young Copper: Mine's Copper. I'm a hound dog. Big Mama: Darlin, forever is a long, long time, and time has a way of changing things. Big Mama: Oh boy, these old wings ain't what they used to be. Big Mama, you better lose a few pounds. Adult Tod: We're still friends, right? Adult Copper: Tod, those days are over. I'm a hunting dog now. Boomer: Oh, shucks! I think I bent my b-b-b-beak. Big Mama: Tod, that Copper is going to come back a hunting dog, a real killer. Young Tod: Oh no, not my friend Copper. He won't ever change. Big Mama: I hope you're right. Young Tod: And we'll keep on being friends forever. Right, Big Mama? Chief: Well, well. Company has come to see the invalid. Chief: How do you like that? They didn't even ask how I'm feeling. Young Tod: [about Chief] His ears are almost as big as yours. Young Copper: That's not the part you gotta worry about. Young Tod: Gosh, look at those teeth. Young Copper: That's the part you gotta worry about!